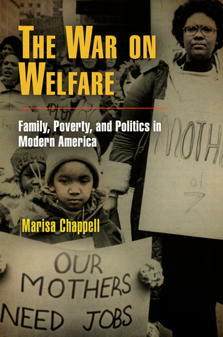 Marisa Chappell published The War on Welfare in 2010. Marisa Chappell (Marisa Schreihofer), B.A. 1991, just earned tenure and promotion to Associate Professor at Oregon State University in Corvallis, Oregon, where she teaches twentieth-century U.S. history. She recently published two books. The War on Welfare: Family, Poverty, and Politics in Modern America (University of Pennsylvania Press, 2010) is a monograph based on her Northwestern University dissertation (2002), and Welfare in the United States: A History with Documents (Routledge, 2009), co-authored with Premilla Nadasen (Queens College) and Jennifer Mittlestadt (Rutgers) is a short analytical history of the Aid to Families with Dependent Children Program with forty primary source documents intended for undergraduate teaching. She is currently researching a project on community organizing for economic justice in the last third of the twentieth century. She lives in Corvallis with her husband, Patrick Chappell (91C, Psychology), who is an Assistant Professor in the College of Veterinary Medicine, and her thirteen year old son, Everett.